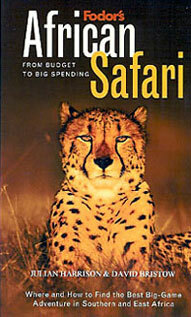 Julian Harrison, President of Premier Tours is the author of a book entitled “African Safari”. Published by Fodor’s Travel Guides, the book includes useful information such as where to go in Africa, when to go, what animals you are likely to see in each country, how to pack, malaria precautions, suggestions on photographic equipment, how your guide should treat you and how you should treat your guide, etc. Endorsed by Conde Nast Traveler Magazine, National Geographic Traveler, Men’s Journal and the London Daily Telegraph.